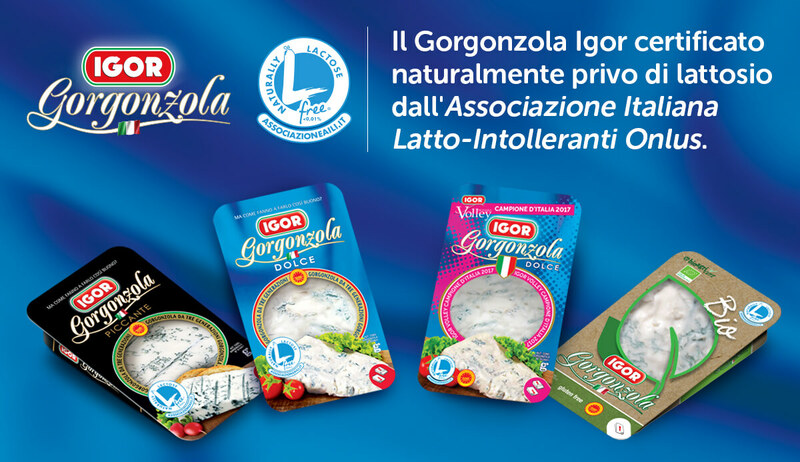 All the IGOR Gorgonzola cheese has been certified NATURALLY FREE OF LACTOSE by the Italian Association Lacto-Intolerant Onlus (AILI). On 16th June 2016, the Italian Ministry of Health with DGSAN 24708 declared that a dairy product can be defined NATURALLY LACTOSE FREE when the lactose residue is less than 0,1 g in 100g. The Italian Association Lacto-Intolerant Onlus gives permission to use the logo to companies whose products have a lactose residue 10 TIMES lower than the parameters of Ministry. IGOR has demonstrated compliance with this parameter by showing AILI multi-year analysis on its Gorgonzola cheese and performing analysis at an accredited laboratory, carried out by the certifying body. The tests performed on IGOR Gorgonzola cheese certified a lactose residue lower than 0,01 g in 100g of product, a quantity 10 times lower than the parameter of Ministry. Until today, IGOR Gorgonzola cheese is the only one to have obtained this important certification.